Second Baptist Church is a member of the South Carolina Baptist Convention and the Southern Baptist Convention. Through these organizations, Second Baptist provides support for a vast array of ministries around the world. 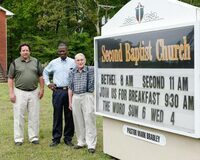 The membership of Second Baptist holds to a firm belief in the accuracy and completeness of the Holy Bible. The most important aspect of our beliefs is the plan of salvation that God weaved through the entire Bible culminating in the crucifixion and resurrection of His only begotten Son - Jesus Christ. It is through that sacrifice that we may gain forgiveness of our sins and a promise of eternity with God forever. Established in 1971, Second Baptist has been led by three pastors - Pastor Johnny Jenkins, Pastor Bob Porterfield, and Pastor Mark Bradley. Pastor Mark is currently serving at the church.